The fun doesn't have to stop after AAU! 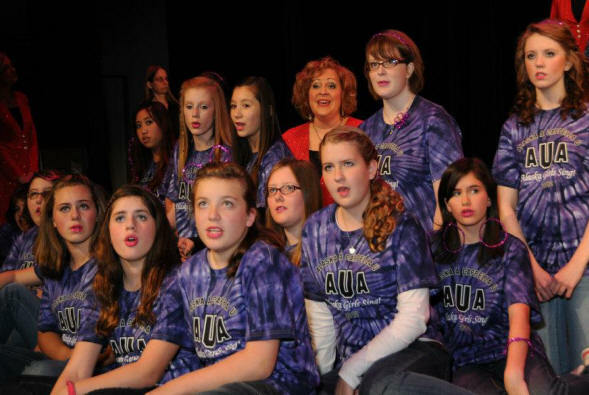 Want to keep singing a cappella harmony in school? Start bugging your music teachers now! We can come visit your school and spend time in class teaching more songs that you could sing on your school concerts. We can also bring education materials that your music teachers will love! Tell your music teachers to visit this website for more information! With three of your friends in a quartet! If you just want to some exploring on your own, below are some links that will show you all about Alaska Sound Celebration, Sweet Adelines International, their Young Women In Harmony program, and videos of barbershop harmony in action! YouTube: These fun videos, below, will give you an idea of what's being done in the world of Sweet Adelines these days!